When the holidays wrap up and the New Year rolls in, many people begin planning for their next vacation, but you don’t have to wait until summer… There are so many great places to travel if you need a bit of R&R after the holidays, so I put together this list of winter vacation ideas from a few of my favorite places catering to adventurous and outdoor loving travelers. 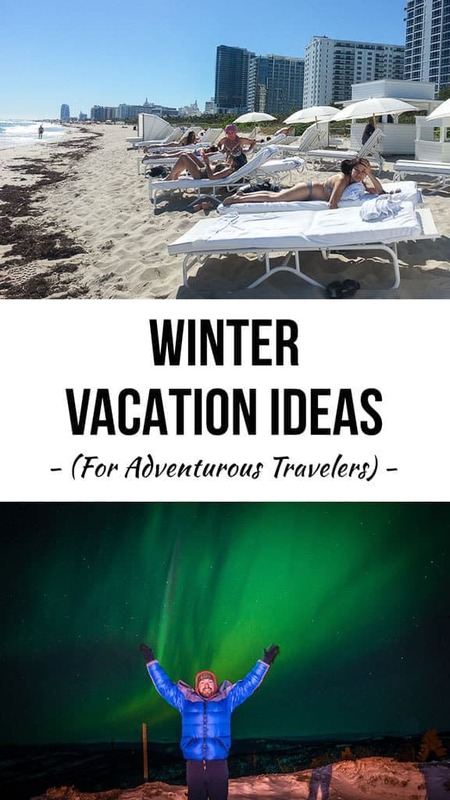 These winter vacation destinations focus on areas that are easily accessible to travelers in North America, aren’t super expensive, and while they focus on places to escape the cold and dreary winter weather for a bit of sun, I’ve also thrown in a few awesome cold weather winter destinations that should be on your list. So without further ado, here are 7 Awesome and Adventurous Winter Vacation Ideas. Sometimes we forget that you don’t need to fly to another country for a taste of semi-tropical weather, sun, and beaches. Miami is a great city that can feel like going to Latin America, but where you can still use dollars and speak English. There’s plenty of great Cuban and Colombian food, and the drive down to Key West is among the best drives I’ve ever done. There’s also cool adventure travel stuff to do in the area, like head into the Everglades, go on an air boat ride, or eat fried alligator bits. I visited in the middle of January and it was a great break from grey Seattle. This is about the opposite of Florida, but Fairbanks in winter is unlike anything else I’ve ever experienced. Sure, it’s cold and dark, but imagine standing below the swirling colors of the Northern Lights or going dog sledding. Truly, it is one of my most cherished vacations, and I’d highly recommend taking a road trip down to Anchorage so you can pass by Denali, the highest mountain in North America, and see some more spectacular landscapes. We visited in March, so the cold wasn’t so extreme, and the days were already getting longer. 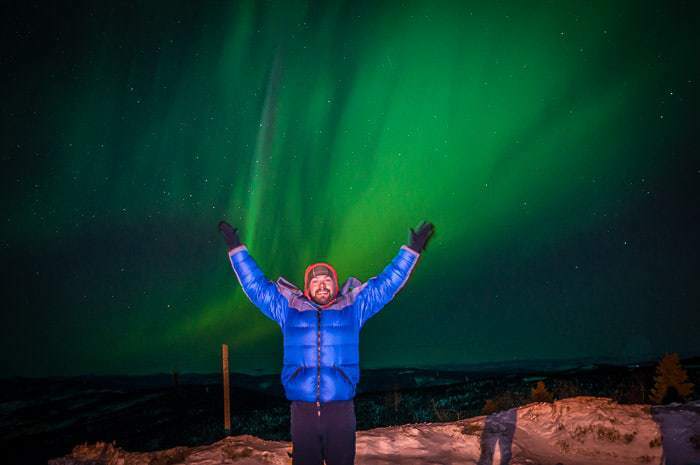 Read More: When’s the Best Time to See the Northern Lights? Winter is probably the best time to visit Sin City, since the temperatures in summer can be absolutely insane. Sure, you can do the typical casino stuff along the Strip (although I prefer Fremont Street downtown), but there are also so many adventure activities close to Vegas. 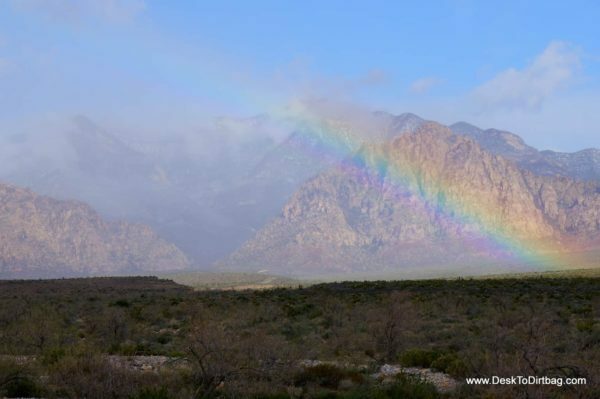 For one, right near by you’ve got the beautiful Red Rock Canyon area where you can hike or climb, then you’ve got Lake Mead to the east, and you can even go skiing just to the north at Mount Charleston… How’s that for variety? Even further afield you can easily visit Death Valley, the Grand Canyon, or Zion National Park, just to name a few. It’s an awesome basecamp for winter adventures. In the far southwest corner of Colorado you’ll find the sleepy little town of Ouray, which is like an adventure seekers dream come true. The town is most famous for the ice park where you can learn how to ice climb in a friendly and accessible manner. It might sound extreme, but it’s totally doable if you’re the adventurous type. Nearby you’ve got towering white mountains where you can go snowhoeing in a ghost town like Ironton, or you’ve got world class skiing destinations like Telluride and Silverton. The town of Ouray itself is small, but there are plenty of great restaurants, bars, and good coffee to be had. And you can pass the evenings hanging out in the awesome hot springs as the snow falls around you. 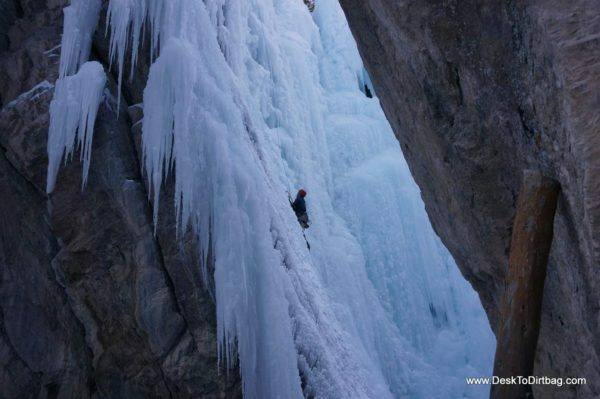 Just be aware of the Ouray Ice Fest, when the town fills up with people from all over the region and even country. Everyone knows about Mexico and how it provides an awesome escape for those looking for a little bit of sun and beaches, but many are afraid to head to Mexico (although that’s a bit unfounded, IMO). 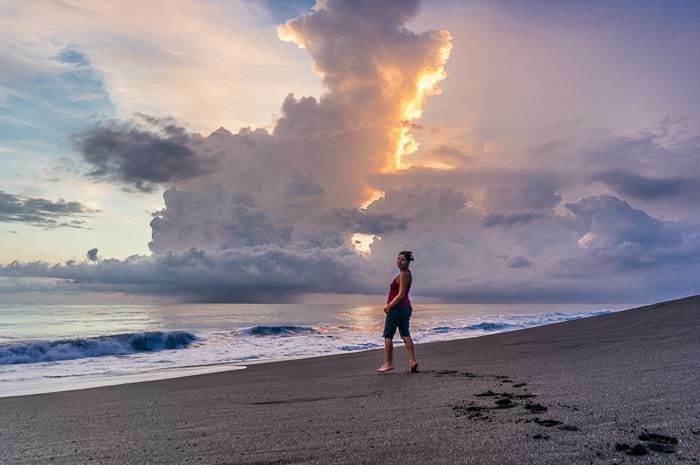 So, why not head to explore a little further down in Central America? My top two favorite countries were Guatemala and Nicaragua. Guatemala has an incredible culture, amazing ruins, quiet beaches, and is super affordable. 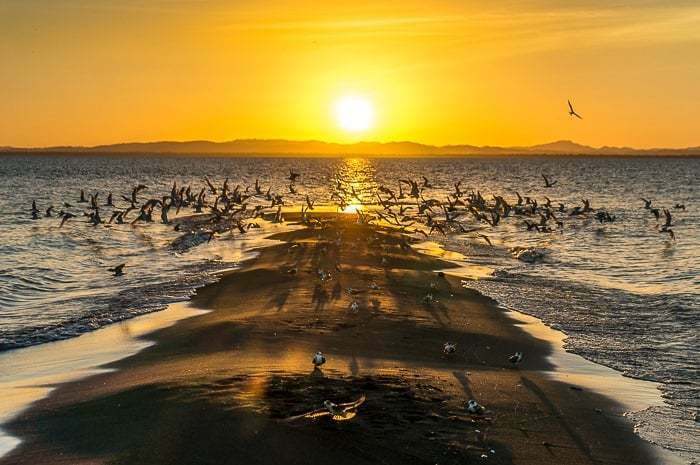 Nicaragua packs a big punch into a little area, ranging from awesome cities like Grenada, to the island of Ometepe, or the surf town of San Juan del Sur. It’s also super affordable. Any of these places is packed full of adventure activities ranging from sandboarding, climbing volcanoes, jungle hikes and wildlife, white water rafting, ziplining and more. My next picks would be Costa Rica or Panama. Does the name Colombia bring up images of Pablo Escobar, kidnappings, and cocaine? Well, that time has long come and gone. It’s actually quite safe and sane. It’s also a surprisingly modern and awesome city, which is known as the City of Eternal Spring for its agreeable climate all year round. 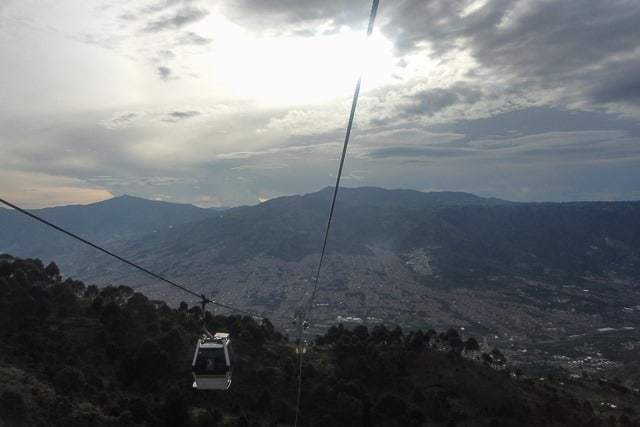 If you’ve got the time, you can explore more of Colombia as well, including the famous Caribbean Coast, like Cartagena, or head up higher in elevation in Bogota. Since it sits so close to the Equator, sunset is at 6:30 PM year round with 12 hours of daylight. While the very act of traveling to Colombia might be considered a huge adventure, there are also plenty of awesome adventure activities to be had throughout the country. You can trek into the Lost City Ruins, visit one of the many national parks, or visit the adventure sports capital of San Gil. Alright, we’re getting a little further away, but sometimes the worst part about winter isn’t just the cold but the lack of sunlight and short days. Don’t you hate when you get off work and it’s already dark? None of the destinations so far have long days in winter, so for that, you’ll have to head south of the Equator where it is summer. Santiago, Chile is a great place, near the spine of the Andes with views of the mountains. Here you can drink the famous Chilean wines and wait for the sunset at 8:30 or 9pm. 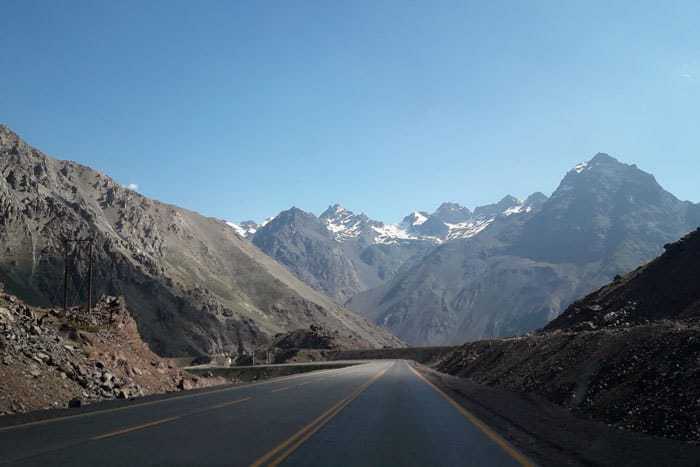 For adventure activities you can head high into the Andes, or head to the coast and explore beach towns like Viña del Mar or Valparaiso, but be sure not to leave Santiago without doing a tour of a famous vineyard like Concha y Toro. So there you have it! 7 Awesome and Adventurous Winter Vacation Ideas that I love for many different reasons, which I hope will inspire your next trip when you’ve got the winter blues. Do you have a place you love to travel during the winter? Sound off in the comments below. Did you enjoy this post? Take a second to share it on Facebook, Pinterest, or Twitter. Thanks!